Irish Spectrum Radio host Gerry Byrne will be holding a competition on his radio show today. The lucky winner will receive a pair of ringside tickets for the Dave Murphy, in association with Acourtier Events, “independence Day” extravaganza, which is headlined historic Jennifer Retzke versus Angel McKenzie GBC World Light Middleweight title clash, at York Hall in London on Friday 5th July. 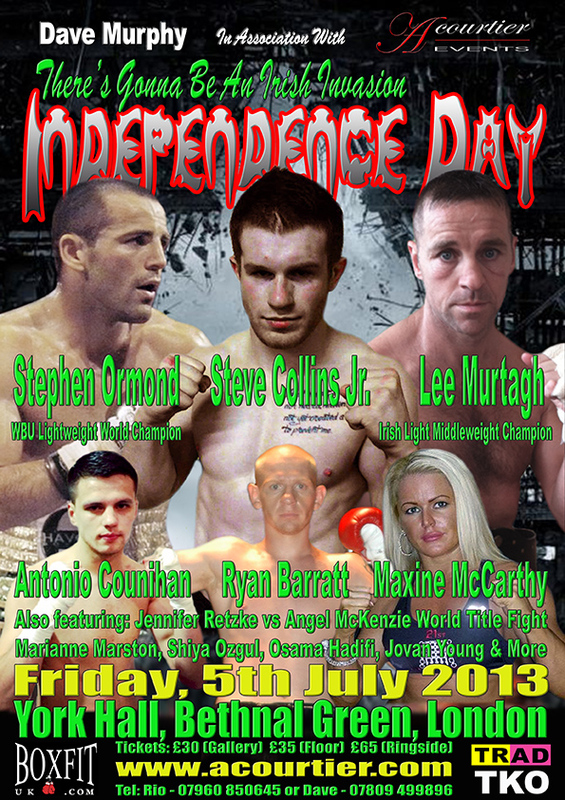 This afternoon Gerry will be interviewing newly crowned WBU Lightweight Champion of the World Stephen Ormond, who along with fellow Irishmen Irish Light Middleweight Champion Lee Murtagh, Team GB star Antonio Counihan, former English Super Featherweight Champion Ryan Barratt as well as Irish female Boxer Maxine McCarthy, will also be competing on the July 5th event. After the interview Gerry will be holding a competition, so make sure you are tuned in to ensure a chance of winning ringside tickets for this most exciting of events in the Capital this year. Gerry Byrne's interview on Irish Spectrum Radio with Stephen Ormond will be broadcast at approximately 1.15pm on Saturday, 22nd June. If you are unable to get to a radio or the internet on Saturday, don’t worry the interview can also be accessed on the above sites for seven days. Stephen ‘The Rock’ Ormond, against Michal Dufek, features on the undercard of the Jennifer Rezke - Mikaela Laurén, GBC Light Middleweight World Championship fight, that headlines the Dave Murphy, in association with Acourtier Events, promoted ‘Independence Day’ event, which takes place at York Hall in Bethnal Green, London, on Friday 5th July 2013. Tickets, priced £30 (Gallery), £35 (Ground floor standard seated) and £65 (Ringside) are available on-line at www.tkoboxoffice.com - www.mariannemarston.com - www.acourtier.com - or in person from the TRAD TKO Boxing Gym in Canning town – www.tkoboxinggym.com - and Ringtone Gym in Euston - www.ringtonehealthandfitness.com - or from Stephen Ormond or any of the boxers taking part in the event, or call – 07960 850645, 07809 499896 or 07557 641597 for further information. The inception of Irish Spectrum Radio was in 1992 when well known Irish broadcaster, Gerry Byrne, started broadcasting his popular weekend show aimed at the Irish Diaspora. There was a real need for a programme where Irish ex-pats could not only keep up to date with news from home but find out about how they could socialise with others from Ireland here in the UK and also get current information about Irish entertainment, services and public information. Nothing has changed, which is why Gerry was pleased to hear from Dave Murphy and Acourtier about their plans for a great night of boxing on 5th July. Irish Spectrum's weekend shows are light entertainment programmes with music at their heart. Sport is also a popular element of the show and Gerry Byrne is delighted to welcome Stephen Ormond onto the show, also anticipating that he will speak with other boxers who will be on the York Hall card talking to him next week. Irish Spectrum listeners will be right behind the Irish fighters. Irish Spectrum are pleased that promoters Dave Murphy in association with Acourtier events are bringing its audience full details of the bumper card, which also features ladies' boxing. A feature of the weekend shows eagerly awaited is the quiz and listeners will be excited that they will have a chance to win tickets for the Independence Day bouts on 5th July. In addition to Gerry Byrne's weekend shows on Irish Spectrum, he presents specials for BBC Radio 3 Counties on his Irish Link programme. He is also well known on the Irish circuit visiting leading Irish venues as MC/compere with his Irish Radio Roadshow. Gerry is frequently the subject of editorials in Irish publications. Irish Spectrum Radio reached a landmark in 2012 clocking up 20 years on air with Gerry behind the microphone throughout. Gerry was touched to receive acknowledgements from the Irish Ambassador to the UK, many Irish organisations in Great Britain, artists such as Nathan Carter and Daniel O'Donnell and, most importantly, listeners recognising his contribution to Irish heritage, culture and entertainment. Gerry is always pleased to hear about events that will appeal to his audience and collaborating with Dave Murphy and Acourtier Events means he can give a platform to The Irish Invasion boxing night as part of the Independence Day theme, with further dynamic bouts scheduled in the capital later in the year, which will also be highlighted on Irish Spectrum. Gerry was pleased to realise a vision in 2012 when he launched a companion music station, which broadcasts online 24/7. This increased airtime has widened the scope of information he can bring to his strong audience base - tune in to www.irishradio.org to hear your favourite Irish country music and for updates on the Dave Murphy and Acourtier Events “Independence Day/Irish Invasion” boxing extravaganza. Should you have news of an event or item of interest for Irish Spectrum listeners please email: gerry@irishradio.org.